You've read the classic on win-win negotiating, Getting to Yes ... but so have they, the folks you are now negotiating with. How can you get a leg up ... and win? Win-win" negotiation is an appealing idea on an intellectual level: Find the best way to convince the other side to accept a mutually beneficial outcome, and then everyone gets their fair share. The reality, though, is that people want more than their fair share; they want to win. Tell your boss that you've concocted a deal that gets your company a piece of the pie, and the reaction is likely to be: Maybe we need to find someone harder-nosed than you who knows how to win. We want the whole pie, not just a slice." However, to return to an earlier era before win-win" negotiation was in fashion and seek simply to dominate or bully opponents into submission would be a step in the wrong direction—and a public relations disaster. By showing how to win at win-win negotiating, Lawrence Susskind provides the operational advice you need to satisfy the interests of your back table—the people to whom you report. He also shows you how to deal with irrational people, whose vocabulary seems limited to no," or with the proverbial 900-pound gorilla. He explains how to find trades that create much more value than either you or your opponent thought possible. 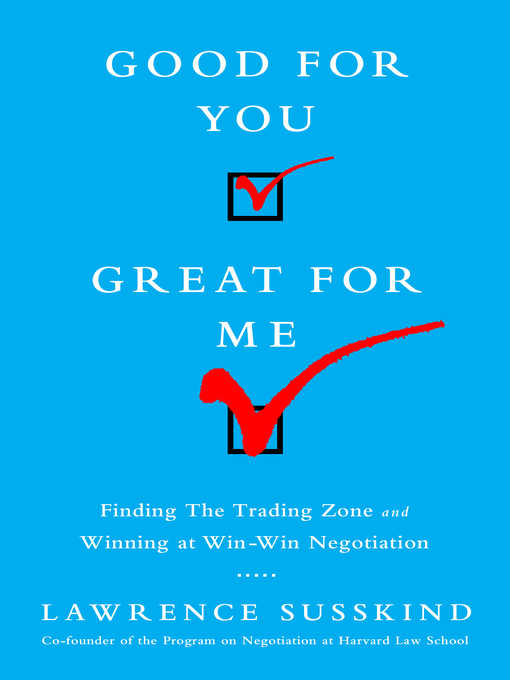 His brilliant concept of the trading zone"—the space where you can create deals that are good for them but great for you," while still maintaining trust and keeping relationships intact—is a fresh way to re-think your approach to negotiating. The outcome is often the best of both possible worlds: You claim a disproportionate share of the value you've created while your opponents still look good to the people to whom they report.